For Chad and Timesha’s reception, we were at the Fernhill Country Club in Clinton TWP Michigan. 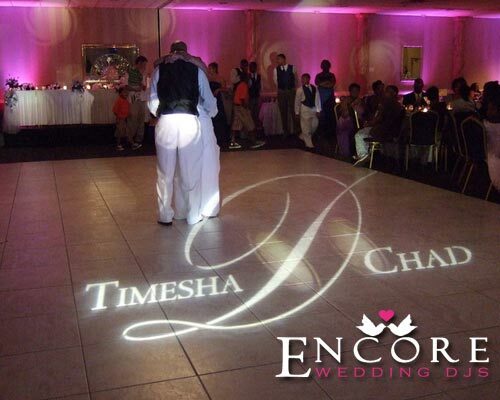 Our wedding DJs provided the uplighting and custom name monogram. You can see how is makes for an awesome backdrop in your photo above. Since their ceremony was at the same location our Going to the Chapel package worked perfectly. Once the dance floor opened, it was immediately PACKED. Favorite song of the night was Jamie Foxx – Blame It. You can checkout their survey here and read more of their comments here.